The game of golf has a long and proud, not to mention captivating history. Learn all about the origins and history of golf below. During the early 1400s, a new game using sticks, a pebble, and a hole was formed on the eastern coast of Scotland in an area known as the Kingdom of Fife. It wasn’t wholly original. 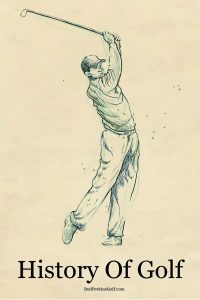 Other games involving carved sticks hitting a ball had been played in many other countries for numerous centuries, but this was one of the first that included the ball going into a hole. Golf quickly grew in popularity in Scotland. Influenced by citizens such as sheepherders who would play the game as a way to stave off boredom while tending to their flocks. The herders would use their staffs to strike the rocks down the land and, eventually, into rabbit holes. Using supplies provided by nature, the inexpensive game grew in stature among the more impoverished Scots. In fact, the game became so favored with the Scots that the Scottish monarchy took notice when they felt golf had become a national distraction. Fearing an invasion from England, King James II had ordered mandatory archery practice for his citizens. Believing that golf and soccer were a hindrance to this practice, King James II banned the two sports in 1457. In the official declaration of the ban, James II used the term “golf” to describe the game. To that point, the game had been given a variety of spellings of the name “golf.” But James II’s use of “golf” in the declaration is the name that endured to present day. But after several decades of watching the Scots ignore the directive, the ban was finally removed by King James IV in 1502. For those Scots advocating for an overturn of the ban, it certainly didn’t hurt that James IV was openly known as an avid local golfer. After the ban was lifted, golf began to flourish across Europe. Further endorsed by royalty such as King Charles I of England and Mary, Queen of Scots, in Scotland, the game became a desired pastime of the rich. Commonly referred to as the Mother of Golf, Mary was responsible for the term “caddie” as it was adopted when she used French Military cadets to assist her on the golf course when studying in France. For her, this love of the game became controversial and dangerous when she upset the Church by playing a round of golf just a few days after her second husband was murdered. The Church believed that Mary had not grieved adequately for her deceased spouse. As the game grew in acceptance over the next couple of centuries, the equipment began to improve and modernize. Sticks were replaced with metal club heads and wooden shafts. Rocks became leather balls that were filled with feathers. The new technology made the game faster and more enjoyable. But these advancements created a debate as to how the game would be played moving forward. One of the biggest discussions revolved around the proper amount of holes needed to constitute a round of golf. This rumor had a slice of truth coupled with a lot of folklore. There was a meeting at St. Andrews that was important in determining that 18 holes would be the length of a round of golf but the rumored influence of scotch had no impact on this decision. At St. Andrews, in the mid-1700s, a round of golf had become a 22-hole marathon. Ten holes on the course were played twice with only the 11th and 22nd holes used at the turn and the conclusion of the round. Sensing a change needed to be made the club captain, William St. Claire organized a meeting of The Society of St. Andrews Golfers board on October 4th, 1764. The minutes from that meeting have been preserved and St. Claire wrote, “The captain and gentlemen golfers, are of (the) opinion, that it would be for the improvement of the links, that the four first holes should be converted into two. They, therefore, have agreed that for the future, they shall be played as two holes, in the same way as presently marked out.” The club removed two additional holes to make the course stand at 18 holes. Even with the change, other courses around Scotland and into England did not immediately change their layouts. Most of the courses in these areas were restricted by the amount of land owned by the club. Some courses could only muster seven holes, while others could cover a sprawling 25. As an example of the diversity of opinion, the Open Championship first began in 1860 on a 12-hole course in Prestwick. Clubs did not begin to officially adopt the 18-hole format for a round until the board of the newly minted Royal and Ancient Golf Club of St Andrews finally made it a written rule in 1858. They stated that one round at the St. Andrews Links was considered to be 18 holes. It was 94 years after they had transferred the Links at St. Andrews to 18 holes. In the mid-1850s, as golf began to find its commonly known form in England, the world started to take notice. The Open Championship became more and more popular leading to amateur championship tournaments in countries such as India and the United States. The first golf club in North America was founded in 1873 in Montreal, Canada and named the Royal Montreal Club. Twenty years later, the first 18-hole course in the United States was formed in Wheaton, Illinois and called the Chicago Golf Club. In 1894, the USGA (United States Golf Association) was formed. Seven years after the first 18-hole club was formed in Illinois, over 1,000 golf clubs had formed across America.